Wood fired ceramics is a process where the fire leaves its mark on the work. Either the fly ash melts to create glaze or the flames leave lick marks that vary in patterns on the pot. 42 cu. ft. kiln designed by Julie Crosby. Built in October 2013. Our first firing was in Februaru 2014. It was cold and we fired for 26 straight hours. The results were fantastic. Early in the firing it's a lot like having an outdoor fireplace. Building up the hot coal bed is necessary to bring the temperature up. There were 4 potters that participated in the first firing of Monty (Short for Monty Python). The work looked great with good ash deposits and flashing. 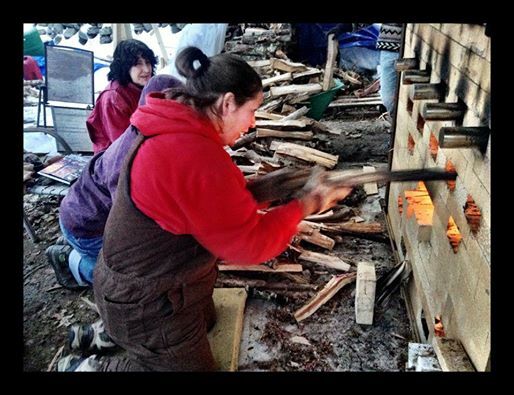 Kim Medeiros and myself prepping wood at Chris Gustin's anagama for firing next week. My mom asked me to create a memorial plate for a cousin in Italy. This is the final ink work. It will be fired later this month.